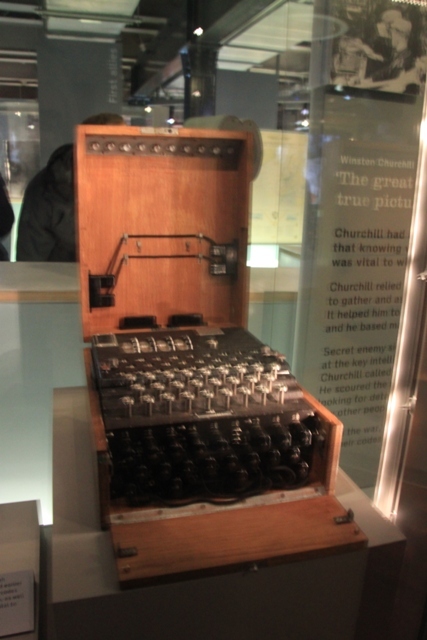 Much news coverage here last week about the 50th anniversary of Churchill’s death – completely coincidentally we spent an afternoon in the Churchill Museum and Cabinet War Rooms on our London weekend – in hindsight good timing. A labyrinth of offices, map rooms and sleeping quarters deep under Whitehall which are in exactly the condition they were at the end of World War II. 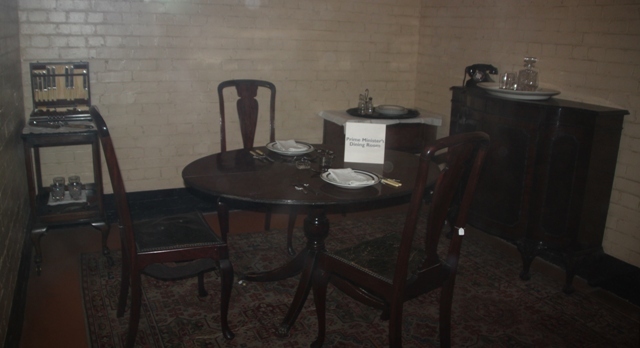 This is the very place where Churchill convened his war cabinet and (occasionally) spent the night. Husband and I had visited years ago, utter fascination was our lasting memory, so we decided to return with Son in tow. 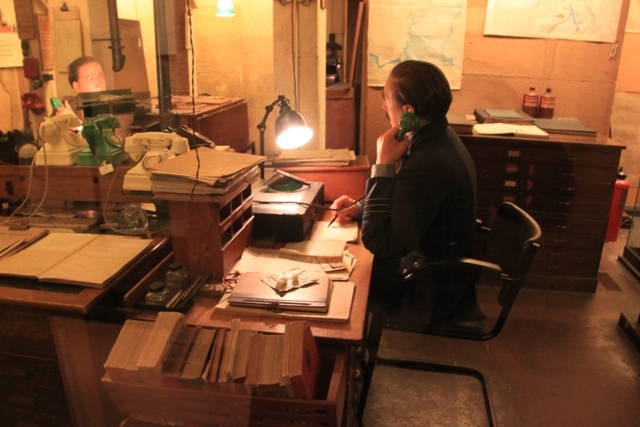 We fancied the double whammy of culture – learn all about Winston Churchill and tour the one-time secret bunker. Entrance fees are fairly steep – £18 for adults but I had stumbled across the fact English Heritage members get 2 for 1 on adult tickets. It’s not made clear at the entrance but definitely worth knowing. In need of sustenance before we tackled those tunnels we made our way to the cafe first of all. Fighting against the tide somewhat – it is in the middle of the museum meaning you have to follow the tunnel half-way along and dodge people already on the self-guided tour. Worth the slight hassle though, we found it blissfully empty at midday – later in the afternoon it was horribly packed. The food was delicious, definitely worth a visit and it set us up nicely for the next couple of hours. Fed and watered and raring to go we headed back to the entrance, picked up our audio guides and set off. The whole place is like a very powerful time capsule. 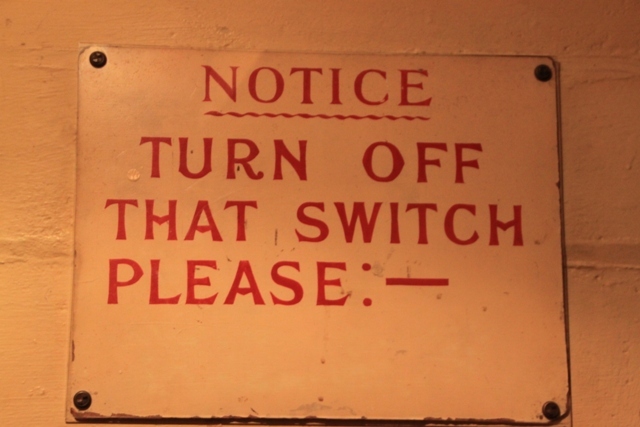 It was the inner sanctum of the British government in World War II, the doors were locked on 16 August 1945 and everything is pretty much as they left it. 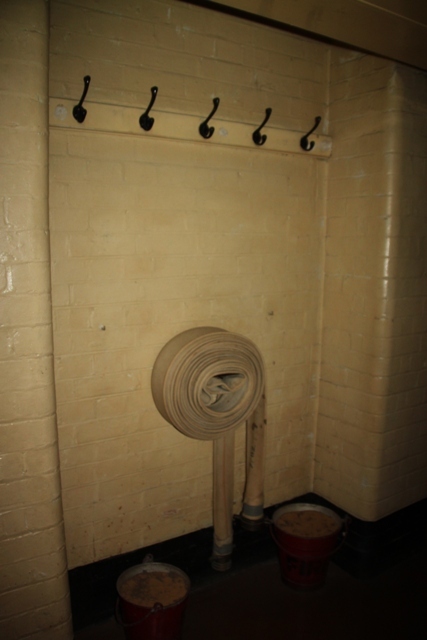 The atmosphere is slightly eerie and ghostly – you really get the sense this is no reconstruction but the actual secret warren of bombproof rooms. Quite gloomy and bleak throughout we really got a great sense of how awful it must have been for the 500 or so people who worked here and rarely saw the light of day. There were signs around which told them weather conditions above ground, we even found a sun lamp they used as many suffered from a Vitamin D deficiency due to lack of sunlight. 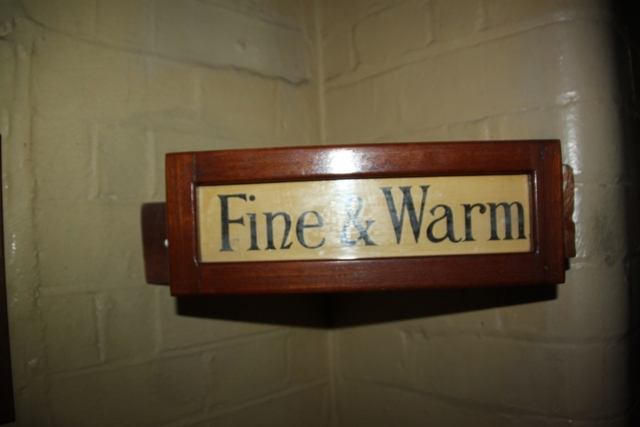 The sleeping quarters were fascinating, Son was fascinated by the chamber pots under every bed. All those people lived here but there were no flushing toilets. 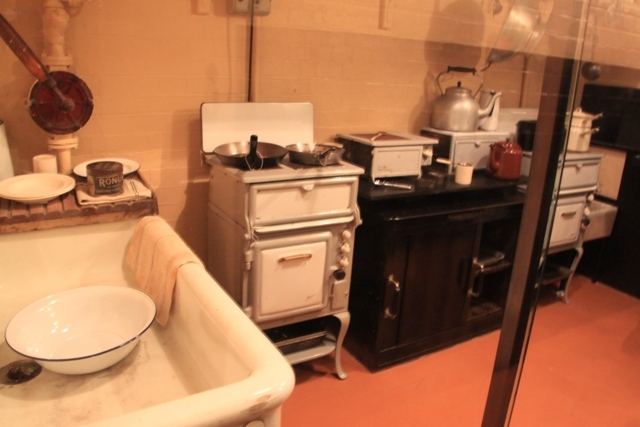 We saw the kitchen, the private dining room for the Churchills and even their bedrooms. A broom cupboard, pretty innocent looking from the outside had a telephone with a direct line to the White House. 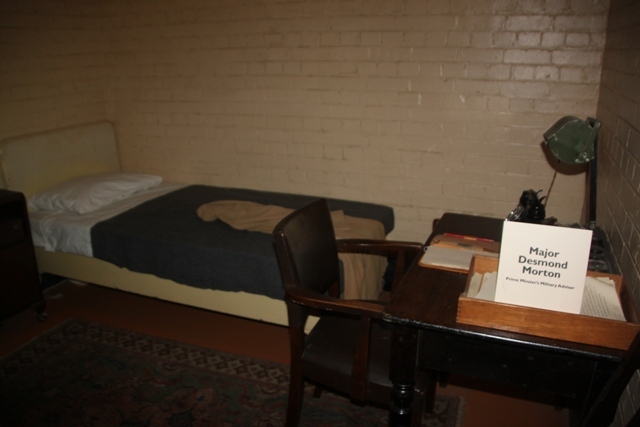 Churchill’s bedroom was where he addressed the nation. There is a BBC microphone in the room, this was the very spot where many of those stirring broadcasts took place. Beside his bed was the metal box he used to put out his cigars. 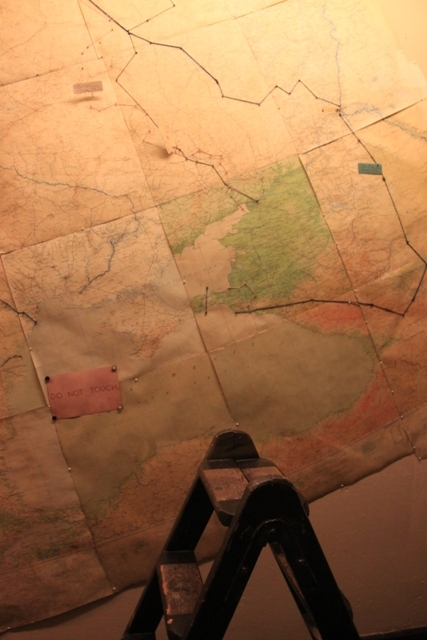 I found the Map Room particularly intriguing – two original maps on the wall are covered in pinholes marking the positions of mines, U-boats and there was a pencil drawing on it of Hitler. 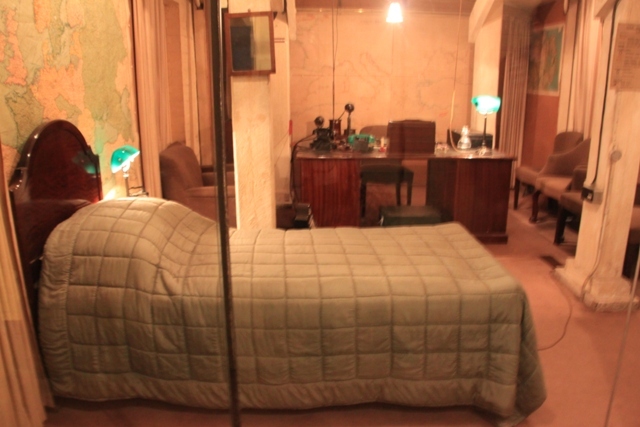 Midway through the bunker is the (relatively) new Churchill Museum. This is all very modern and takes up 10,000 sq ft to tell the story of Churchill’s life and personality. It covers five key chapters in his life starting with the war years. Most intriguing for me was his childhood and having never seen the TV coverage of his funeral before, I was engrossed. The video footage of this was unmissable. 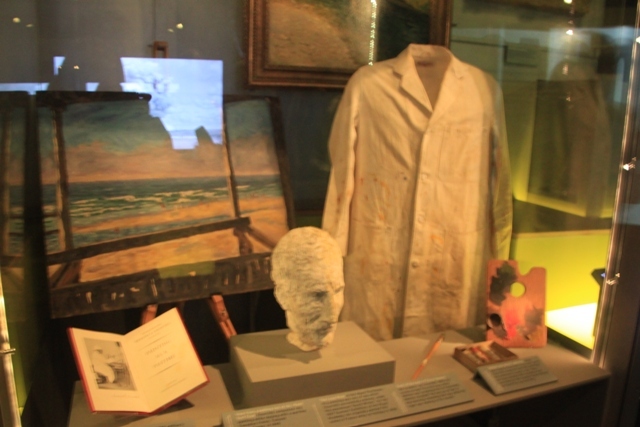 Lots to read, speeches to listen to and so many personal items on display – everything from his bow tie to his bowler hat, his siren suit and the coat he used to paint in, they even have the original front door to No 10 Downing Street. 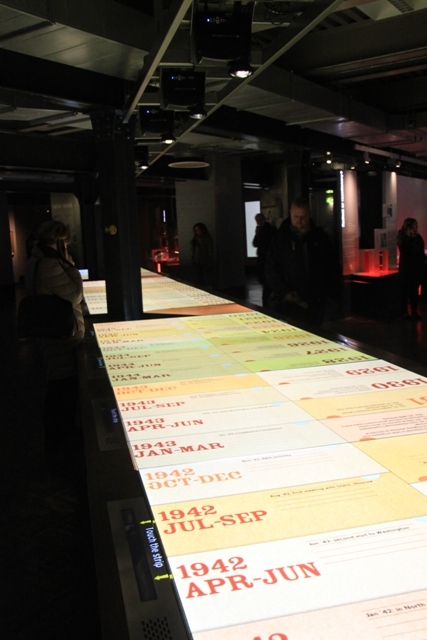 Son wasn’t so interested in all of this but he did enjoy the centrepiece – a 50 foot interactive table covering every month of Churchill’s life. Touch a date and the file opens with pictures, documents and lots of information. This kept him more than busy. A fascinating and incredible museum – I loved the thought of being able to explore a place most never knew existed until the late 1970’s. The fact everything – including the rationed sugar cubes in one of the desks is still there, more or less as they left it when the lights were turned out in 1945 makes it even more intriguing. 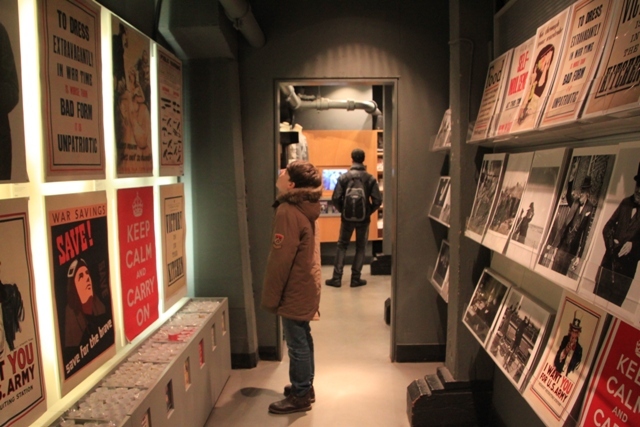 We spent about four hours in the bunker and the museum. Thoroughly enjoyable but we were very glad to go above ground and see daylight. Renewed admiration for those who in the bunker who saw it so rarely. Thank you for sharing your experience. I don’t know if or when I’ll visit London so I’m enjoying your blog immensely! Churchill is a powerful historic figure. Thank you for reading!! If you do get to London this is a great place to visit, a bit off the beaten track for most tourists but so interesting and atmospheric! I definitely want to visit on my next trip to London. It looks like a great experience, and a whole new insight to life during the war. It is completely fascinating Amanda – so atmospheric and so much to see, we were really glad we went there. I’ve enjoyed reading about Winston Churchill in the past. 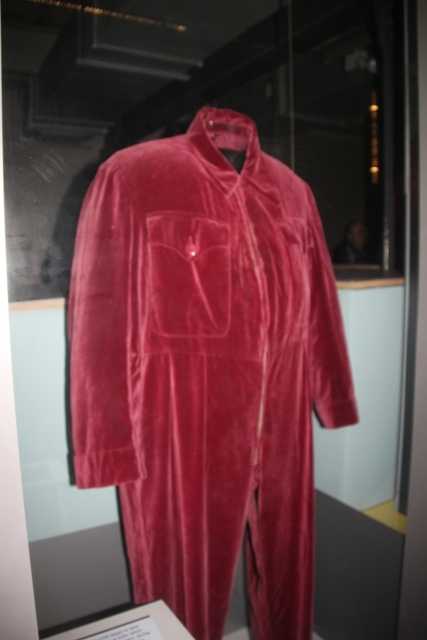 I can understand why they needed 10k square feet to display his life and personality. He is such a huge character – his life was so interesting right from the word go. 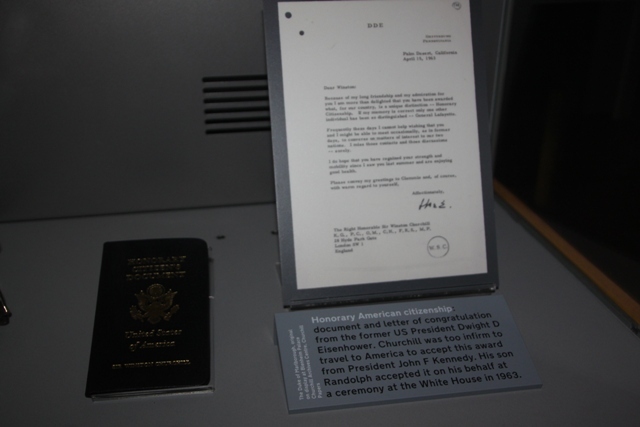 So many personal belongings on show here too – even his school reports, it was fascinating. Thrown back into a different time. Awsome! It was just like stepping back into the 1940’s – just glad we could step back out of then again!! I walk past this nearly every day – really must pop in sometime! thanks for sharing. It’s so interesting – definitely worth a look when you have a spare few hours!! Love the look into the past – fascinating! I will share this with our senior history teachers – I know the students will love to see the pictures. Thank you! It was so intriguing and interesting – just like stepping back in time for a few hours. The pictures weren’t so great – very dim lighting made it tricky, but hope they enjoy it!! It really is – you feel like you step back in time here and experience the conditions first hand! It looks like an entirely fascinating place to visit. We had always intended to visit but we somehow never got around to it. It is always great to ponder history and what an event must have been like when you are in the context of the same space the events unfolded in. 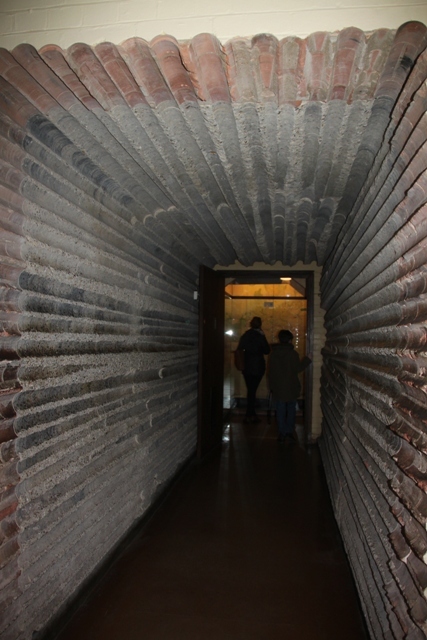 Have you been to any of the regional secret bunkers? We spent a happy day rooting around in the one in Essex. It was so interesting and a bit eerie too, which actually added to the whole experience. 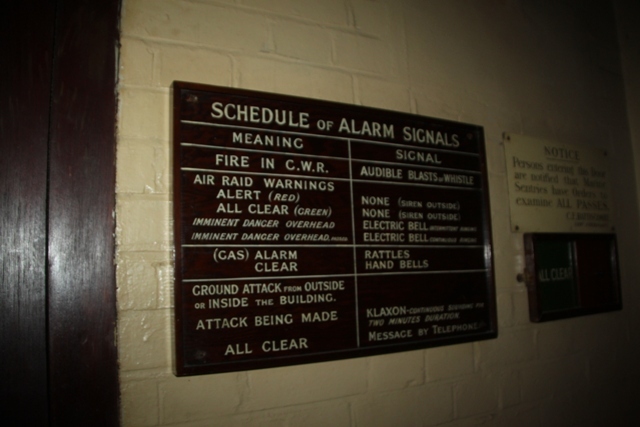 We’ve been to the bunker at Hack Green in Cheshire – another fascinating day and nearly went to the one in Essex once!! It looks good too. The one in Essex is operated by amateur enthusiasts which means it is all a bit cobbled together in the most charming way. My siblings have been to the bunker in Fife too. I think they are all quite similar. They are definitely eerie places, not least because there is no natural light at all. This a great article! It brought back fond memories of a visit my family and I, along with some dear friends, made to the war rooms and museum in August of 2012. There is so much to see that I plan on returning for another visit in the future. We visited years ago for the first time and I was so intrigued and always wanted to go back. It took a while, but we made it in the end and I wasn’t disappointed second time around. It is fascinating – I know exactly what you mean about so much to see. It’s almost impossible to take it all in during one visit! Marvelous post! Mike & I were there years ago, before the museum. I was also quite struck by the map room. Haven’t taken tween yet. Glad to know about the interactive table. The interactive table definitely helped with the younger member of our family!! It was great, we could read and linger over what we found interesting and he was still occupied!! Our first visit was also before the museum – it’s definitely worth going back again if you’re in London. 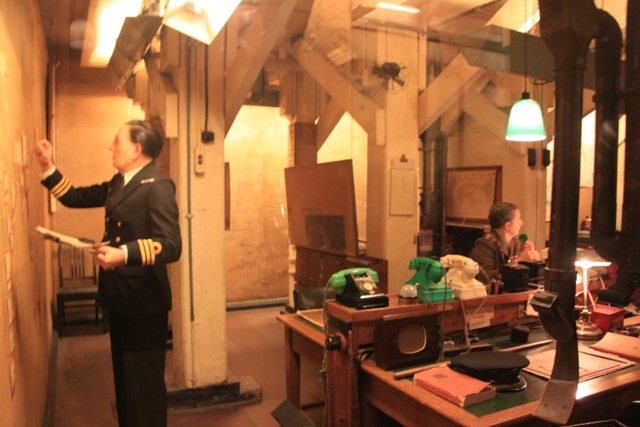 We’ve never been to Churchill’s War Rooms, but I think we’ll have to put it on our list! It’s so interesting Anna and the great thing is you take it at your own pace! It’s definitely worth a visit sometime Rosemary, I’m sure you would really find it fascinating. We all enjoyed it – everybody liked something different in particular. It really feels like you are stepping back in time, the whole place is so spartan and austere too, hard to imagine spending one night there never mind an indefinite number!! Hope you enjoy your weekend too. I’ve meant to go every time I was in London but never got there. Now, I absolutely must see this treasure. I can’t believe 500 people worked there. Did they all sleep there, too? How big is this place? Great post, Joy. This is my kind of travel. The tunnels are quite extensive and stretch a long way, but I couldn’t imagine spending one night here!! Most of them did work and sleep in the bunker – we saw the bedrooms for the special advisers/cabinet members etc and they were pretty spartan. You don’t get to see where the “ordinary” people slept, just a set of steps leading to another level below ground and huge dormitory type accommodation. Apparently it was horrible, rats etc.. just doesn’t bear thinking about….. We found it so fascinating, you really must go next time you visit London!! It’s an amazing place isn’t it. 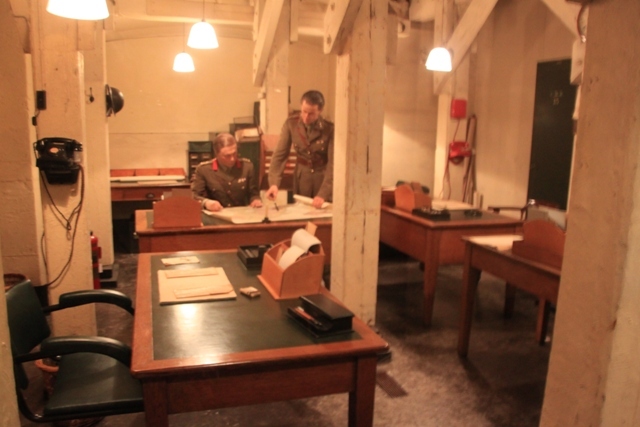 I took my father to the War Rooms on a UK visit a couple of years back. It sounds like you were able to spend a decent amount of time in there without your son getting too restless! My husband and I went years ago and I always fancied going back, we left it until now because we thought our son might not appreciate it quite so much. This visit was ideal, he loved the tunnels and although the Churchill Museum did not quite have the same attraction for him, there were things to keep him amused so we could browse at our leisure. It is a great place for sure! What a great experience, funnily enough we were at Chartwell on the weekend but the house was closed. 😦 I think a trip to the Churchill Museum is in order over the summer. Add to my huge long list! That’s a shame about Chartwell – we had the same experience a few years ago then finally made it back there last summer. It is so interesting, loads to see in the house so definitely recommend going back if you get the chance sometime! The museum is great too – you can take it at your own pace as well, always helps with little ones!